On the 23rd of February we came across these specimens of Cymopterus multinervatus on the southwest slopes of the Cooke’s Range (southern Black Range). They were growing on a dry slope with a gravel cover. Scientific synonyms for this species include Phellopterus multinervatus and Vesper multinervatus. The Vascular Plants of the Gila website calls this species Corkwing Wafer-Parsnip. Other sources refer to it as Purplenerve Springparsley, Arizona Springparsley, and Wild Parsnip. Its current scientific name was established by Ivar Tidestrom (1864 - 1956) in 1935. He is credited with naming more than 200 species. He published the Flora of Utah and Nevada in 1925. In 1941 he published Flora of Arizona and New Mexico with Sister Mary Teresita Kittell an important figure in the study of New Mexico flora. 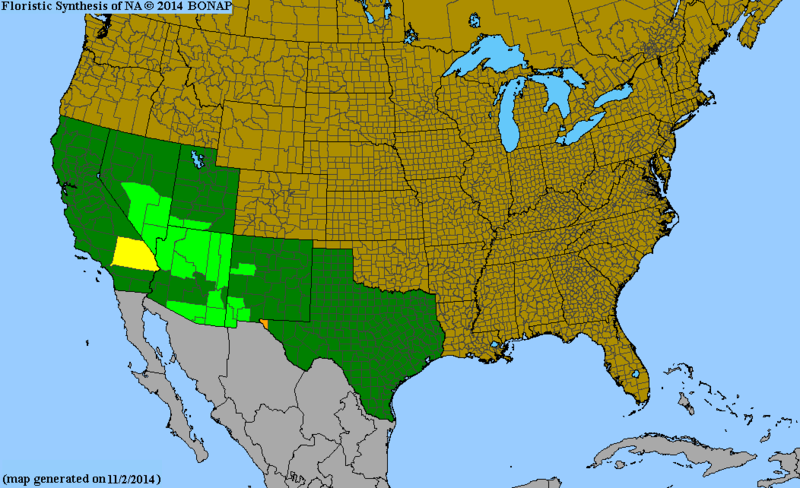 BONAP list the species as Vesper multinervatus, see map to right and indicates a limited range within the United States. We found these specimens in the area where Grant, Sierra, and Luna counties meet. It is not listed as occurring in Sierra County on this map, although it is listed as being native and not rare in the other two. In Mexico it is found in at least the state of Baja California. It is generally found at elevations below 5,000’. The Native American Ethnobotany Data Base indicates that this species was used by the Hopi as food. This species is a fairly early bloomer, blooming during March and April (and in this case, late February). Its leaves radiate basally from the taproot, there is no stem.